Another afternoon tea outing with Georgia, of Notes on Tea. This time, we’re at King’s Carriage House on the Upper East Side. It’s a townhouse and the outside is adorable, and quaint. Inside this townhouse, in the back of the first floor of this restaurant is a small dining area. Upstairs, there’s another, but for afternoon tea, just the first floor is used. There are about seven tables and it does feel like you’re in someone’s home that has been converted to a restaurant. Even the furniture evokes that look and feel. I can’t put my finger on it, but the room doesn’t feel very cozy and felt a little cold. Maybe it has to do with the yellow walls and cool tones. It was good although not always consistent. There were times we had to wait a while to find a server to ask for a couple of things. There wasn’t a tea menu, and the server recited about five or so teas (black, green, etc.). I went with an Earl Grey, which arrived in cute teaware. Everyone gets a different teapot but we all had the same teacup and saucers. Unfortunately, the tea came in tea bags, instead of loose leaf. And just one tea bag was in the pot, so when the hot water was refilled, the tea was too diluted. 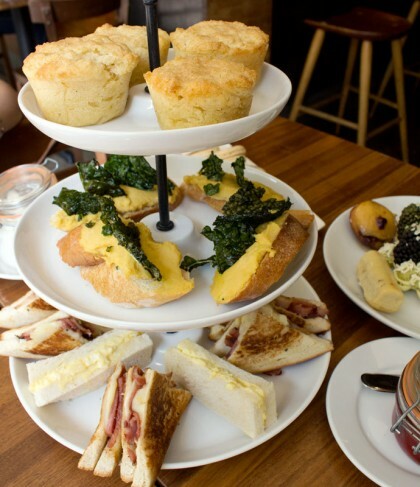 The three-tiered tray with two afternoon tea servings. A good selection of tea sandwiches. However, it didn’t taste freshly made and the bread was slightly chilled. I prefer my savories to be room temperature. There was a goat cheese tartelette that was pretty tasty, and it was my favorite of the bunch. Served warm! Served with heaping mini bowls of homemade jam and clotted cream. Good portion sizes and two served per person. An array of a sweets were on the bottom tray. It didn’t taste like anything was made in-house and they were not that great. I was disappointed that the mini brownies had an icing that had hardened. The presentation was not so great either and this was my least favorite course. With the sweets, came chocolate dipped strawberries that came on a separate plate. This I enjoyed. 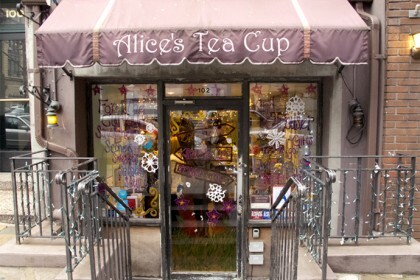 If you’re on the Upper East Side and looking for afternoon tea under $30, this is an ok option, but isn’t as good as other below $30 tea services. I'd forgotten about your under $30 afternoon tea list. Much to do this winter! Hi Georgia, yes, much to eat!